MICROBEAST has an aluminum composite design casing. Its slight di­men­sions allow it to be installed in practically any model helicopter. MICROBEAST can be installed horizontally as well as vertically. The sensory system is based on the newest MEMS technology. Software with sophisticated sensor data processing makes installation in electrical & nitro model helicopters possible. With an optional adapter cable, MICROBEAST can also be utilized solely as a tail gyro. This is recommended especially for whoever is switching from the conventional paddle system and wants to slowly approach the RIGID operation with the 3 axle solution (3G-Gyro Mode). The well-thought-out and easy setup goes smoothly with no need of an expensive programming box or computer. This makes it easy to still change a number of settings even at the airfield. Moreover MICROBEAST’s integrated swashplate mixer enables the use of simple remote control systems which do not have their own swashplate mixing (NO-MIX). 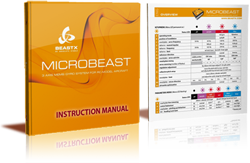 MICROBEAST is able to process many types of sum signals (PPM / S-BUS / Spektrum). With the optional Spektrum Satellite Adapter, installation in indoor model helicopters is also possible without a great number of wires. Updates and advanced setup possibilities (Setups) can be done com­fortably with the optional USB interface „USB2SYS“ via the BEASTLINK interface. Software for Windows & Mac can be downloaded free at www.BEASTX.com.